I am a scientist but some times I am stunned at what science can do. I know I should accept some things done but I was first a Christian before a pharmacist so a lot of things done are really weird to me. I saw this article on the first baby born from a transplanted womb and my jaw literally dropped. Transplanted womb ke? I was still trying to justify surrogacy and now there is womb transplant. I don't know how I feel about it. I am sure there are a lot of pros and cons to this procedure. Oh well, I hope I am never ever in a position to need it. The birth of a baby boy from a womb transplant could bring an end to the woes of women unable to have children naturally, doctors have said. 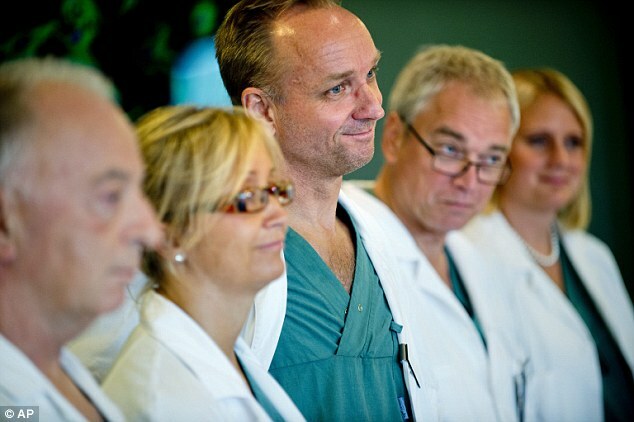 The world's first successful womb transplant saw the birth of the child in Gothenberg, Sweden, last month after years of tireless research. His birth was only revealed by doctors yesterday as both he and his 36-year-old mother are in good health. And with British experts planning to carry out the procedure as early as next summer, a leading gynecologist has said the revolutionary surgery could become as popular as surrogacy among infertile women.Mr Richard Smith MD FRCOG of the UK Womb Transplantation Team celebrated the birth of a little boy in Gothenberg last night, congratulating the doctors who performed the pioneering operation nine months ago. And the gynaecologist, who works at the West London Gynaecological Cancer Centre, Queen Charlotte's & Chelsea Hospital, said the surgery could become a possibility for British women as soon as next summer. 'We're almost ready to go, we are applying for ethics committee approval in the next few weeks at a national level,' he told BBC Radio 4's Today programme. Mr Smith said the medical breakthrough in Sweden could bring about a new era of childbearing for women with fertility problems. 'The great big unknown always was could a transplanted uterus carry a baby and have a successful live birth and that's why what's happened here is so exciting. The doctor added the procedure could become as popular as surrogacy, which 'carries as many risks if not more'. 'It would reduce the demand for surrogacy however there are still plenty of women who will prefer to go down that route and avoid major surgery. Unlike the Swedes' project, his team would harvest the wombs of cadaveric donors - patients whose hearts are still beating but they are brain dead. Like other transplants, it could be rejected. That is the obvious disadvantage. Otherwise, I think it is a brilliant procedure much like other organ transplants. The way I see it, it's humans taking on their rightful place as gods. We are not mere men. Like our Father we should create and improve. The great thing about this procedure is it gives women who would have otherwise had to depend on surrogacy, the opportunity to incubate their babies. It's very brilliant and I applaud them. They said that. And they also said that it might not be able to last long in the receiver's body. Oh mi gosh! Wow. Ok it is good for those who would want to concieve but couldnt..but i cant help feeling and wondering whether would it be my blood coming of the womb, or the donor's during my cycle. ( I know wrong biology assumptions, that's not how it works just picking my brain a bit) Sorry for being graphic but it seems like such a personal thing to donate. I don't know maybe i'm just biased. But overall this is a huge leap for medicine. It is a real personal thing. Some of the wombs donated were the wombs of their mothers so if there is any mix of blood it is still in the family.